External loads act on the visor at sea, when the visor on the superstructure is submerged into the waves, when the ship pitches and heaves in severe weather. The Final report (5) has simulated the total load (the Z-force) acting on the Estonia visor. The simulation (blue in Figure 12.7 of (5) right) suggests it takes 800 hrs (!) 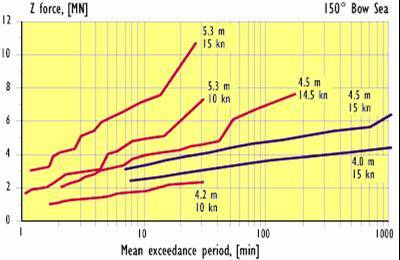 before the Z-force is >6 MN (600 tonnes) upward in a seaway similar to that at the time of the accident (Beaufort 7 with 4,3 meter waves)! 6 MN is a very big wave load that you would not expect in the given weather. How could the Commission suggest that? It is not easy just to calculate hydrodynamic forces on a free floating body of known, uniform shape (a cylinder?) at zero speed in waves and it is even more complex to do the same on a fixed part (a visor) of non-uniform shape (with flare!) attached to a free floating, moving body. And that is without considering any wave impacts on it. An impact is not a hydrodynamic force. (g) the non-linear vertical impact force (sic), which is applied on a part of the visor during a very short time - when it slams into a wave. The weight (a) of the visor acts downwards all the time - say 55 tons for the 'Estonia'. The inertia force (b) acts up/down with the pitching, but as the accelerations are small - max 0,2-0.3 g (g=9.81 m/s²) it does not matter too much - it is of the order 10-20 tons. The principal vertical, upwards load is (c) hydrostatic buoyancy, when the visor is submerged by the ship's vertical motion at the bow. 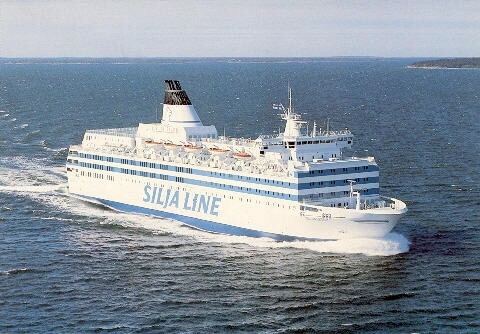 It is a function of the volume of the visor (about 165 m3 to the upper deck eight meters above the waterline for the 'Estonia'). But the visor of the 'Estonia' two meters above waterline was never submerged more than four, five meters and then the buoyancy was maximum 40-50 tons - acting upwards - one or two seconds. Then there is the upward hydrodynamic force (d) due to the velocity/retardation of submerging the visor down into the water. It is also small - say 30% of (c). The Froude-Krylov forces (e) and the force due to stationary flow around the submerged visor (f) are very small. The total gravity, inertia, buoyancy and hydrodynamic forces (a) to (f) are therefore very small, when the visor is submerged for a short while, 2 seconds - the weight and inertia forces are countered by hydrostatic/dynamic forces. In Beaufort 7 with 4,3 meter waves you would expect that the dynamic upward forces never exceeded the static weight of the visor, i.e. the visor would never move at all. These forces you do not hear. They are silent! But the Commission suggests that the wave load was >600 MN! How is that possible? Then there is another vertical load, which may temporarily act on the visor: it is a non-linear impact (slamming) force (g) of transient, very short, nature. It depends a lot on the speed and course of the ship and the shape of the visor and the angle between visor and waterline. The impact load is very noisy and is heard all over the ship. The impact noise - heard as a canon shot followed by vibrations - is generally caused by compressed air caught between the wave and the ship resulting in very high >10 bar local pressure acting on the surface. The Commission believes that this impact load can be of the order 700-1 000 tons acting upwards during some milliseconds - and that it was this load that removed the visor from the superstructure Appendix 2. This assumption is 100% wrong and have no scientific base! The impact may cause high pressure but it is only over a very small area <1 m², so the upward force is <100 tons active during a very short time when the visor is just entering water, i.e. the other other upward wave forces are still zero and the downward forces - weight and inertia - are maxium. The combined force is probably small. The local energy released in the impact may however cause plastic deformation of local outside plate panels and is thus absorbed by the structure, i.w.o. the impact. The impact load can thus not damage locks and other attachment points of a visor remote from the impact as alleged by the Commission. And on the 'Estonia' the shape of the visor, i.e. the slope of visor side against water was such that impacts were very rare. Maybe only impacts described above occurred head-on where the visor was flat against the waves in very severe weather. Figure 3.2.1 shows the visor in good weather. The bow wave is quite high but easily pushed aside by the visor. There is no possibility that such a visor can be knocked off by any wave forces. The Commission suggests that model tests can be used to calculate the full scale forces and moments acting on a visor in a seaway. The writer is not aware of any method to extrapolate the force and moment acting on visor in a seaway measured at model tests to full scale. The various components (a), (b), (c), (d), (e), (f) and (g) follow different scaling factors and are difficult to separate. A local pressure load measured on a model can on the other hand be scaled up to full scale. The Commission suggests that the various force components (a), (b), (c), (d), (e), (f) and (g) can be calculated - simulated - theoretically, while the writer is not aware of any recognized method to this effect. Surprisingly the Commission suggests in the Final report (5) chapters 12.1 and 12.2 that full scale forces on the 'Estonia' visor obtained from forces measured at model tests compare well with forces obtained from theoretical simulations. This sounds nice, but there is no scientific base of the suggestion. Therefore the model tests and simulations of wave forces on visors by the Commission are false! The Class societies suggests that you shall calculate with, e.g. a vertical force (ton) which is a function of the horizontally projected area of the visor, m², multiplied by a hypothetical outside water pressure, which in the case of the 'Estonia' should be about 8-9 ton/m², minus the weight of the visor. The background of this calculation method is unclear (read unscientific) 3.6 but quite good engineering practice. Let's assume that an external, upwards vertical load P (it is the same as the Z-force above) is applied on the visor when it dips into a wave! The vertical load P on the visor can only be transmitted to the superstructure and deck 2 via the three locks and as friction in the vertical packings as the visor is pushed aft into the packings by the locks and external waves. As the vertical buoyancy load is applied on the visor about 2,5 metres forward of the locks and the vertical distance between the side and Atlantic locks is about 2,0 metres - it is assumed that the visor is submerged into a big wave - it is simple to show that a vertical upward load P (generally visor buoyancy minus visor weight and inertia) tonnes on the visor is transferred to the locks as a compressive horizontal force 0,625P via each of the two the side locks and as a tensile horizontal force 1,25P via the Atlantic lock (ignoring friction in the packings). See figure 3.2 right. A vertical load P pushing up the visor will always push the side lock visor lugs towards the superstructure and will always try to pull away the Atlantic lock visor lug from deck 2. Therefore the side visor lugs were always in compression and the Atlantic visor lug was always in tension in service at sea. Depending on the clearances of the three locks and the clearances of the deck hinges some of the vertical load acting on the visor may be transmitted to the superstructure via the deck hinges on deck 4. Then the loads on the various locks are reduced. However, for all practical purposes the only function of the deck hinges was to enable to open/close the visor.